Amongst the two million “doughboys” who sailed for France from the terminals near Governors Island was the commander of the American Expeditionary Forces, Gen. John J. Pershing, and his trusted aide, Lieut. George S. Patton. The doughboys would return to New York, once the war was over, to the cheers of an enormous tickertape parade. And life in the United States as a result of the war would never be quite the same. 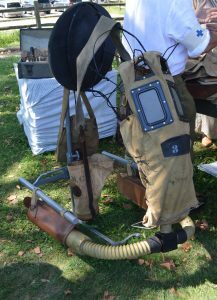 Recalling life as it was actually lived and breathed during the WWI-era, military and civilian reenactors gathered on Governors Island last weekend for the third annual Camp Doughboy World War I History Weekend. 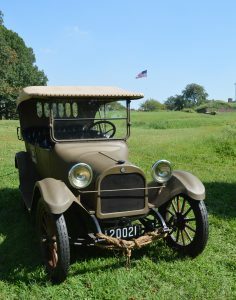 The intriguing experience – which drew some 8,500 visitors to the bustling encampment – was held on the island’s Parade Ground – some five hundred yards east of historic Fort Jay. There wasn’t any marching while we were there, though Fitzpatrick told us the group had planned to use some its time together to polish their military form. Said polish was evident, however, in the care each participant took in presenting life during the First World War. Returning to her display table shortly after her talk, we asked Fehler if she would share something with our readers about the women doctors of WWI and tell us a bit about her unique uniform. Picking up on her lecture, Fehler explained the vexing difficulty women doctors faced in trying to enlist in the service of their country. “Due to this pressure, in 1918, the Army medical corps allowed the women to enlist on a limited basis. The Medical Women’s National Association recommended that a certain number of women be considered. Of those, 55 were accepted and went on to serve. Dr. Barbara Hunt, who served with the American Women’s Hospital – which was formed by the Medical Women’s National Association – was a graduate of Johns Hopkins. She was thirty-four at the time. Her unit served under the French military. Fehler told us that Tjomsland was a Norwegian immigrant and one of the first women interns at Bellevue Hospital when she graduated from Cornell Medical College in 1914. “The way that hospital units which served in the First World War were formed, was they were organized by institutions in the United States. Bellevue formed their unit and Dr. Tjomsland wanted to join. She enlisted as a secretary, and that’s how she got to France. While it might seem the Army fully gave in to the pressure of the women’s organizations, women doctors were far from equal with their male counterparts. “Women were enlisted in April 1918, but Dr. Tjomsland did not receive her enlistment until December, and this enlistment was not as a full officer. The women were listed as contract surgeons, which meant they were still civilians. They did the work of an officer, but they did not have the rank. “It’s hard to say with certainty that none of the women physicians were considered veterans. I haven’t looked up what records remain for all of those who served. But they received no pensions, and the National Archives has no information about them. They received no awards or recognition for their service from the Army. At the end of the war, they were mustered out and that was it,” said Fehler. For more information about World War I, including upcoming events and the effort to build a WWI monument in our nation’s capitol, please read our other stories here, and visit The United States World War I Commission.